2. Add the onions, green chillies, ginger, curry leaves, carrot, potato and peas. 3. Saute for 5 minutes and add coriander leaves. 4. Stir to mix well and keep aside. 5. Heat a tawa and add a little oil. 7. Spread into a medium sized thick circle. Add some oil. 8. Cover and cook on low heat. 9. When it it slightly cooked spread the vegetable mixture evenly. 10. Cover and cook for a minute more. 11. Add some oil to the sides and cook on one side only. 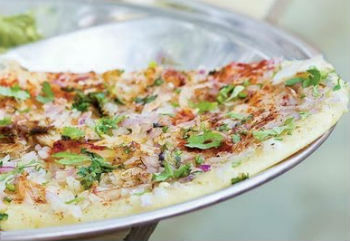 Feel free to comment or share your thoughts on this Vegetable Uttappam Recipe from Awesome Cuisine.